Question: Recently I unplugged my window mounted air conditioning (A/C) unit as it was running to relocate it. I was not able to relocate it at that time so I plugged it back in and now it will not turn on. It will not blow cold air at all, in fact it won’t do anything, it will NOT turn back on. What may have happened? Did I break something by unplugging it while it was running? Please help as it is getting really hot in here!!! Answer: The most probable cause of your AC unit not turning back on is the compressor needs to cool down. (See picture below to see what the compressor looks like and where it is located.) Since you unplugged the unit as it was running, it will not start back up right away as it needs a “cool down period”. 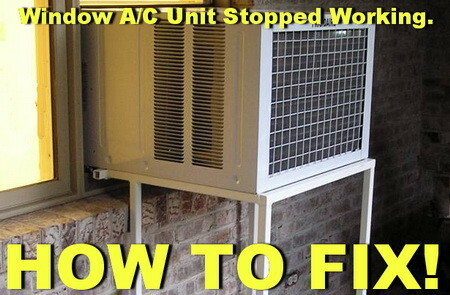 There may also be a time delay built into your ac unit to protect itself. It is also possible that by unplugging it while it was working, that you may have tripped a breaker. Go to the fuse/circuit box and check to be sure that nothing has tripped. If a circuit has tripped, go ahead and reset it to turn power back on. If the circuit was tripped and you flipped it back on and the AC still will not turn back on, then give it time to either cool down or let the time delay play out. Check to be sure that your ac unit is not plugged into a GFCI outlet or possibly there is a GFCI reset on the power plug itself. Make sure nothing has reset. If the AC still won’t turn back on, simply have patience and give it the time it needs to start back up. If the above fixes do not work, there may be more to it then a time delay or tripped breaker. 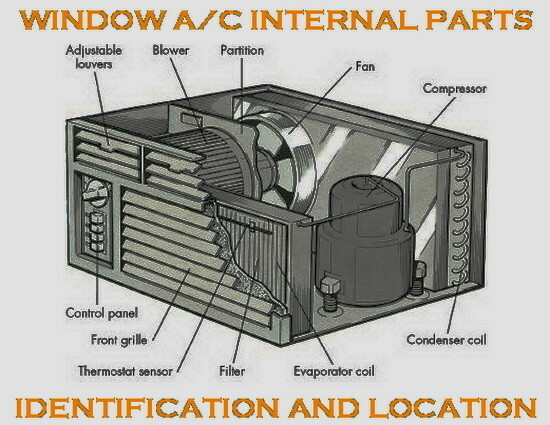 Have a look at the AC parts diagram below. best way to clean it out to maintain maximum efficiency. Have any other tips to fix a window mounted AC? Please leave a comment below. the fan in my window AC unit has suddenly quit working, yet compressor works fine. Whats wrong? Your instructions made my Window Air conditioner come back ON the next day. By giving it time to reset itself. Thanks! I used to live in an apartment with no central AC, and my window air conditioner was my savior. I am looking into another place now that does not have central cooling, and I am thinking I might need to get my unit out of storage. However, I am a little worried that it will not work anymore. I will have to remember to check the outlet and the fuse/circuit box if this happens. Previous post: Water Heater Making Noise? Here Is What To Check Yourself!